Important new clues have been uncovered in the mystery of how wolves became domesticated as dogs. Scientists at SciLifeLab Uppsala and the Broad Institute show, in a study published in Nature today, that the genome of dogs and wolves differ in some important ways. There are crucial differences in genes underlying brain development and function, but also an adaptation of the digestive system to more resemble that of humans. It is still shrouded in mystery when and where dogs and their wild ancestors the wolves went separate ways, but presumably it happened more than 10,000 years ago somewhere in Asia. It may have started by humans seeking out wolves’ dens to catch and tame wolf pups. Alternatively, the wolves themselves may have come closer to humans to look for food in the scrap heaps that became common when humans settled. In the study now published in the scientific journal Nature the researchers have compared the genomes in a large number of dogs and wolves, and mapped areas of the genome that show clear differentiation between the two groups. The results show that dogs went through several developmental steps that adapted their digestive system to a diet richer in starches than that of wolves. Starch, the most common carbohydrate in our food, is broken down into sugar in dogs’ intestines to then be transported out into the blood in a process that involves three different steps. The Uppsala researchers found significant changes to all parts of this process in dogs. “Strikingly the amylase gene is present in many more copies in the dog genome than in wolves. Amylase carries out the first step of the starch digestion”, says Erik Axelsson, lead author and researcher at SciLifeLab Uppsala and the Department of Medical Biochemistry and Microbiology, Uppsala University. A similar, but perhaps less extensive, adaptation to increased intake of starches has been found in us humans, which reflects how tightly linked the evolutionary history of humans and dogs are. This means that by studying the effect of genetic changes during the domestication of dogs we can also learn about our own species’ adaptations to the environment and related diseases. Apart from the clear adaptation of dogs’ digestive system, the researchers also found many differences in genes that affect how the brain is developed. 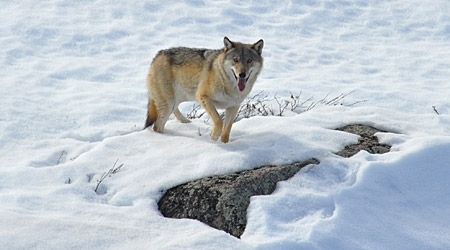 Several of these changes likely underlie why dogs behave differently to wolves. “It was exciting to see that half of the domestication signals in the genome point to genes that have to do with brain development and function”, says professor Kerstin Lindblad-Toh, senior author and director of SciLifeLab Uppsala, and scientific director of vertebrate genome biology at the Broad Institute. The research group will now continue to study in detail how the genetic adaptations affect dogs’ behaviour.